It was about a year ago when the Pokémon Go! game took to the streets, and everywhere you looked, people were walking around looking at their smartphones trying to catch a Snorlax. Justin got these tattooed at Addiction NYC (@addictionnyc) in New York City. 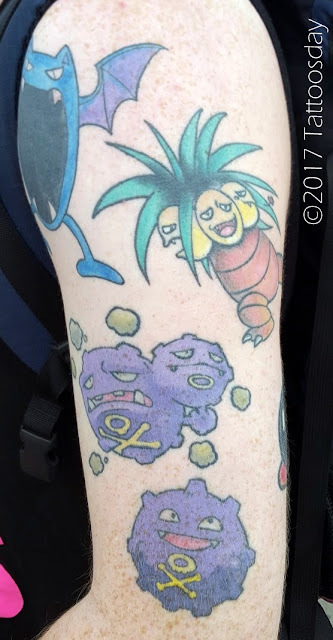 Thanks to Justin for sharing his Pokémon tattoos with us here on Tattoosday! 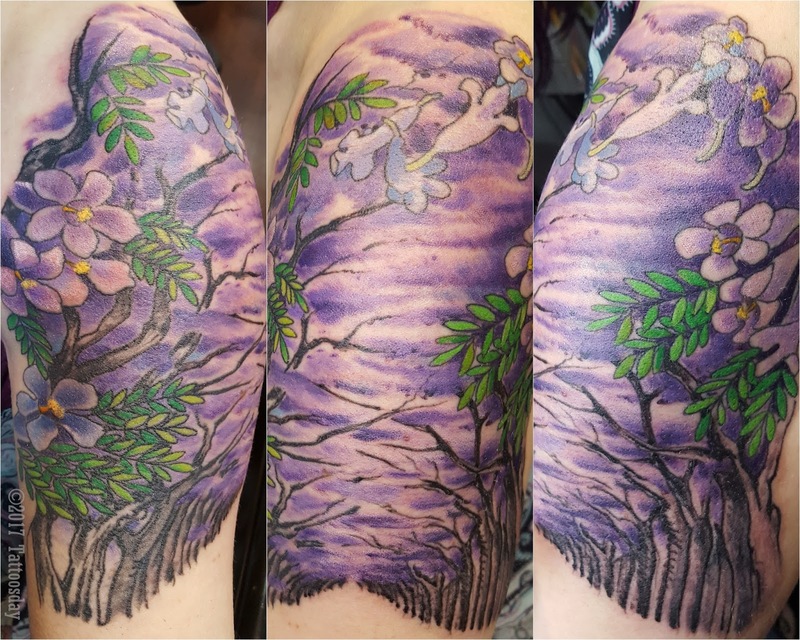 She credited this beautiful tattoo of wildflowers to Guy Ursitti (@tattoosbyguyursitti) of Eight of Swords Tattoo (@8ofswordstattoo) in Brooklyn. She chose wildflowers because, aside from their beauty, they represent a theme of freedom. Thanks to Ameris for sharing this stunning tattoo with us here on Tattoosday! Heidi explained that she was in recovery, and that one day she was out walking and there was a moment where she saw an owl, and there was a connection. "I looked into the eyes of the owl," she explained, and the experience remained with her. She credited the artist Zim from Vancouver Tattoo Company in Vancouver, Washington. 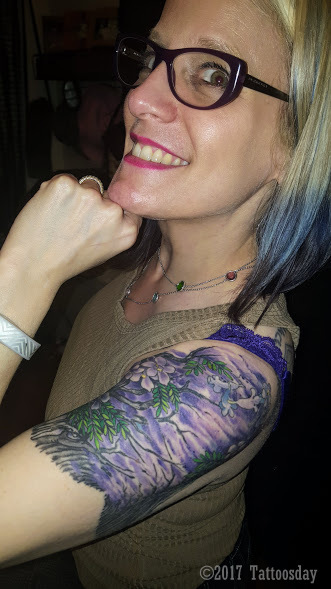 Thanks to Heidi for sharing her owl tattoo with us here on Tattoosday! This past Saturday, I went out to Coney Island to catch the 35th Annual Mermaid Parade (@medmaidparade). This annual tradition has been ideal for Tattoosday inkspotting and this year was a banner year, having interviewed a dozen or so folks with cool tattoos, which we'll be sharing in the weeks to come. 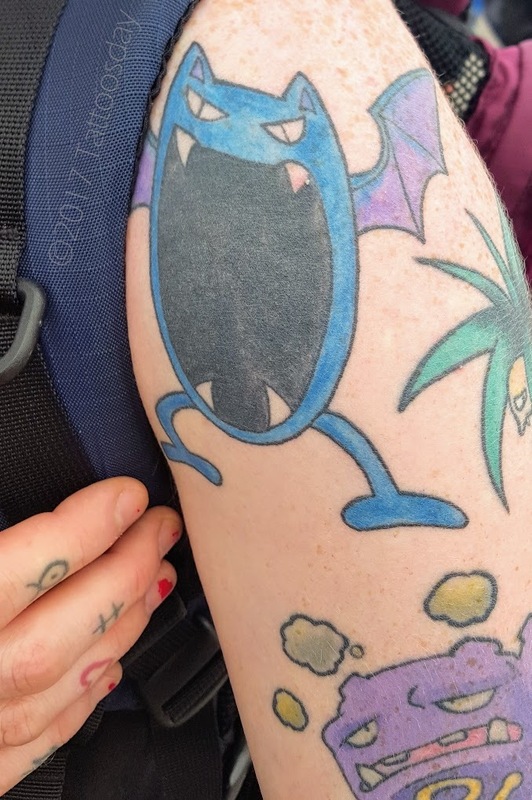 Jill's daughter had a bit to do with this tattoo, especially the top section. "Make me a mermaid," she said, and Jill went to her artist, Timmy Cronin (@TimmyTattooCronin) from Timmy Tattoo in Huntington, New York. "I like his style," Jill told me, and I have to agree. I actually met Timmy at a supermarket in Brooklyn seven years ago (recounted here) and have featured work from his shop a few times over the years. 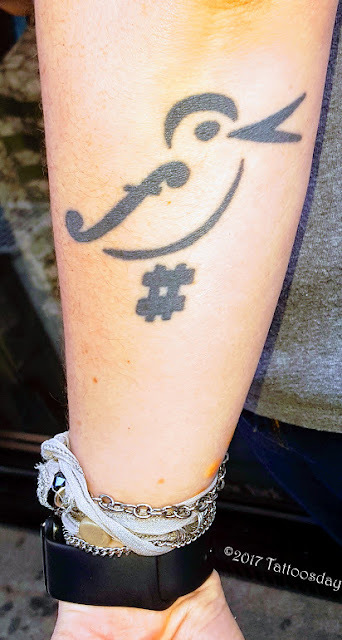 Thanks to Jill for sharing this cool tattoo with us here on Tattoosday! 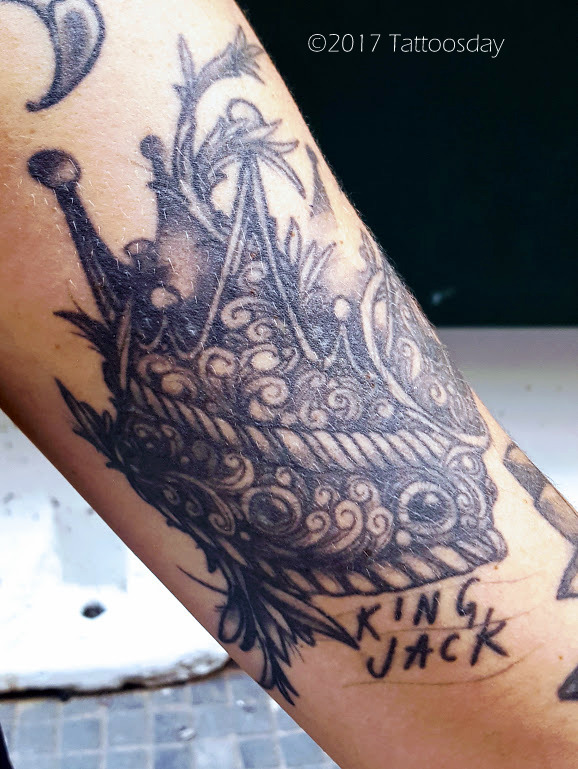 Danielle Celebrates Her Father, "King Jack"
Danielle explained that this crown tattoo is dedicated to her father, Jack, who is "the king" in her world, adding that Jack doesn't like tattoos, but when she showed this one to him, he started to cry. It seemed a tattoo worthy to share on Father's Day. The tattoo was done by the amazing Myles Karr (@myleskarr) when he was at Three Kings Tattoo. He now runs Escapist Tattoo in Brooklyn. Thanks to Danielle for sharing this cool tattoo with us here on Tattoosday! Happy Father's Day to all, especially to King Jack! In the last week, we lost the great Adam West, who originated the role of Batman on television. I saw this yesterday on Broad Street in lower Manhattan, on the arm of Jes, and she told me she got it because it was an expression she and a friend of hers would say to one another all the time. It was done at True Blue Tattoo (@TrueBlueTattooNYC) in Queens, several years ago. 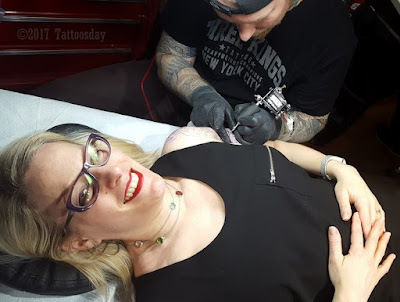 Jes shared a bunch of other tattoos, as well, but I'm saving them for another post. I just didn't want to wait to post this one, which reminded me of the passing of the Adam West, who many of us regard as the "original" Batman. Thanks to Jes for sharing this with us here on Tattoosday! I met Jessi at the beginning of the month, while walking up 8th Avenue. Yes, it's a bird, but it is a design created entirely out of musical notations and dynamic markings. The sharp symbol (hashtag/pound sign) represent the feet. The forte marking (the f) is the wing. The crescendo (the < shape) is the beak. The head and eye are created by the symbol for fermata, or pause. Finally, the slur, which forms the underbelly, is represented by an arc. "I'm not a music major, I'm just a music fan," Jessi explained, adding that she saw the design online and "stole" the idea for her own tattoo. Jessi had this done at Neptune Tattooville (@neptunetattoo), but does not recall which artist did the work. 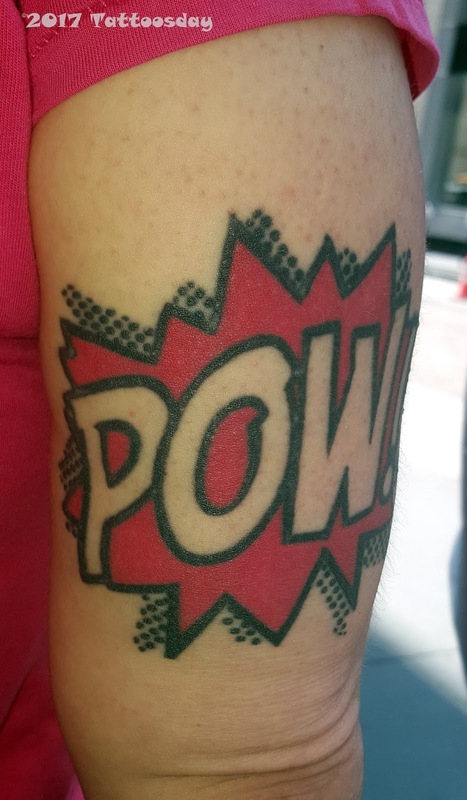 Thanks to Jessi for sharing this cool tattoo with us here on Tattoosday! 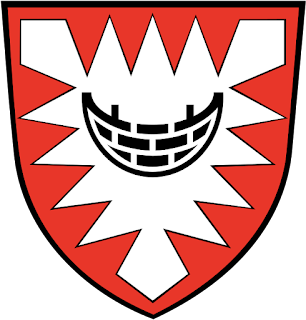 The tattoo is a tribute to his home, the city of Kiel, Germany. The tattoo was done by Eddie from East Coast Tattoo in Preetz, Germany. Thanks to Nico for sharing this cool tattoo with us here on Tattoosday! 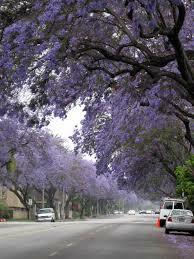 Anyone familiar with the jacaranda tree knows how beautiful they can be. It is this time of year in Southern California, in the months of May and June, when they explode into bursts of purple blossoms that are simply breathtaking. "First of all, I love purple. 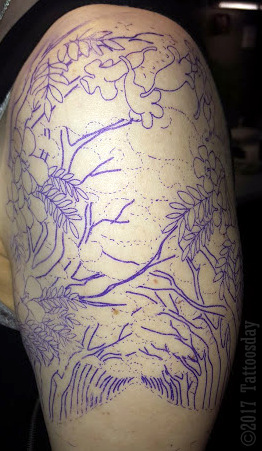 And when I got the purple flower tattooed on my ankle, I realized purple looks really good on my skin. Also, they remind me of our time in California where we met, the college campus where I met my husband, and so many of my friends, and Pasadena, the only place I really liked living in California. It was on my list, there were two or three other ideas I really wanted. I knew I wanted this one. Since I've gotten this, talking to people who were familiar with jacarandas from South Africa, which we only discovered was a place they grew while researching them. This makes me want to go there and visit." This lovely tattoo was done by the incomparable Alex McWatt (@alexthreekings) at Three Kings Tattoo (@threekingstattoo) in Manhattan. Thanks to Alex at Three Kings for another great tattoo, and to Melanie for sharing her jacarandas with us here on Tattoosday!